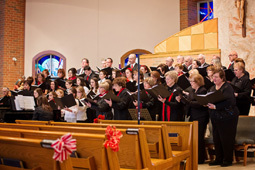 The concert program serves as a fund raiser, and funds raised by monetary sponsorships and ads placed in the program are used to purchase music and needed equipment. If you would like to support the SJV Music Ministry please consider placing an ad in the Christmas Concert Program. Ads can be commercial or just in support of the many talented musicians that volunteer their time to brighten our celebrations with song. Watch for details on how to submit your ad.